The story of this deck begins with crisis. I spent the summer of 2007 traveling in southern Africa. I came home severely ill and thinking about the people I’d lived with, about mutual aid, about social systems that prey on illness and poverty, about cultural myths that make certain kinds of suffering seem normal. Back home in Philadelphia, my friends were facing problems that were similarly complex. As I tried to get diagnosed and treated, I spent many days flat on my back, overwhelmed by all of the hard things. In my delirium and anxiety I began to dream of protective talismans. I was thinking both of Frida Kahlo’s retablos and the necklaces my mother used to give me as symbolic armor when I was afraid to go to school as a young child. I drew a dozen protective images, fairly quickly, and pasted them on the faces of playing cards I’d picked up on city sidewalks. I gave these to my friends at my 30th birthday party–and they insisted that I draw a full deck. I kept at it slowly, while working several jobs and continuing to struggle with my health. It mostly got finished because my friends kept bothering me about it, asking when it would be done. 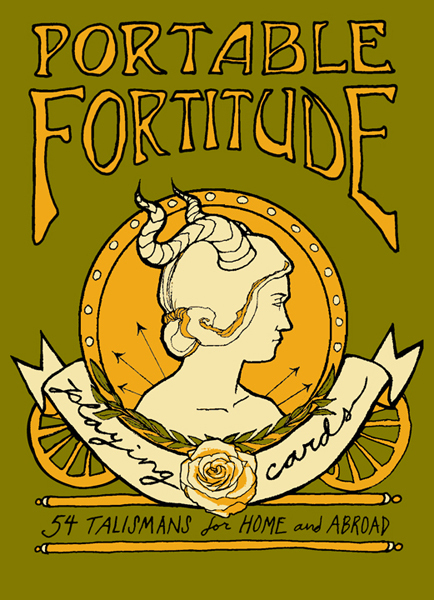 Three years later, I published Portable Fortitude. Selling this deck has changed my life. It’s an incredible feeling to have made something so useful to so many people. I’ve been humbled and grateful to hear the stories of what people use it for–rituals, writing prompts, tattoos, divination–and how it’s come into their lives. When I first printed the deck, I didn’t have a website set up for comments and I regret that now–I’ve gotten so many amazing stories from people. If you were one of those people, or if you’re just now coming across the deck and want to share a story about how you use it or what it means to you, please leave a comment below! Interested in a deck? Buy one here. Interested in a lot of decks? Bulk discounts here. PS Do you have any more of your incredible patches left for sale?